Our highly-skilled therapists perform full-body therapeutic massage to help you achieve total relaxation and stress reduction. At your request, we can focus on specific areas needing special attention. 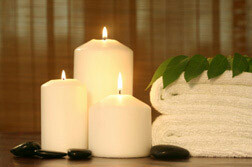 Massage sessions include 50 minutes of hands-on therapy, plus time for consultation and dressing. We use only the highest quality pure, hypo-allergenic products, and we are committed to your comfort and satisfaction. Book today to experience complete rejuvenation!